2. A mixture is different from a compound because __. 3. What is the percentage of sulphur in sulphur (IV) oxide? 4. A gas X diffuses twice as fast as gas Y. if the relative molecular mass of X is 32, calculate the relative molecular mass of Y. 5. 200 cm3 of a gas at 25oC exerts a pressure of 700 mmHg. Calculate its pressure if its volume increases 350 cm3 at 75oC. 6. An element X has electron configuration 1s2 2s2 2p6 3s2 3p5. Which of the following statements is correct about the element? 7. Beryllium and aluminium have similar properties because they __. 8. If the difference in electronegativity of elements P and Q is 3.0. The bond that will be formed between them is __. 10. The radioactive radiation used in studying the arrangement of particles in giant organic molecules is __. 11. A silicon-containing ore has 92% 28Si, 5% 29Si and 3% 30Si. . Calculate the relative atomic mass of the silicon. 12. The nitrogen obtained from air has a density higher than the one from nitrogen-containing compounds because the one from air is contaminated with __. 13. Water is said to be temporarily hard when it contains __. 14. On exposure to the atmosphere, a hydrated salt loses its water of crystallization to become anhydrous. This phenomenon is referred to as __. 16. The dispersion of a liquid in a liquid medium will give __. 17. The major and most effective way of controlling pollution is to __. 18. The basicity of CH3COOH is __. 19. The colour of litmus in a neutral medium is __. 20. The mathematical expression of PH is __. 21. Which of the following salts will turn blue litmus red? The oxidizing agent in the reaction above is __. 25. How many faraday of electricity is required to produce 0.25 mole of copper? 26. Z in diagram above represents __. 27. If the change in free energy of a system is -899 Jmol-1 and the entropy change is 10Jmol-1k-1 at 25°C, calculate the enthalpy change. 28. 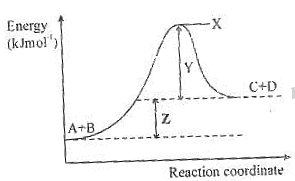 In an equilibrium reaction, which of the following conditions indicates that maximum yield of the product will be obtained? 29. In a chemical reaction, the change in concentration of a reactant with time is __. 30. What happens to the reaction above when the hydrogen ion concentration is increased? 31. 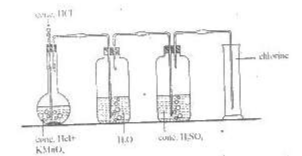 Which of the following will liberate hydrogen from dilute tetraoxosulphate (VI) acid? Use the diagram below to answer question 32 and 33. 32. In the diagram, the function of the concentrated H2SO4 is to __. 33. The gas that is removed by the water in the flask is __. 34. Fluorine does not occur in the free state in nature because __. 35. In the extraction of sodium from fused sodium chloride, the anode is made of platinum because __. 36. A compound that gives a brick-red colour to a non-luminous flame is likely to contain __. 37. In the electrolytic extraction of calcium from calcium chloride, the cathode is __. 38. A few drops of NaOH solution was added to an unknown salt forming a white precipitate which is insoluble in excess solution. The cation likely present is __. 39. The general formula of haloalkanes where X represents the halide is __. 40. The IUPAC nomenclature of the compound above is __. 41. The alkanol obtained from the production of soap is __. 42. Ethyne is passed through a hot tube containing organo-nickel catalyst to produce __. 43. Due to the unstable nature of ethyne, it is stored by dissolving in __. 44. The process of converting starch to ethanol is __. 45. The polymer used in making car rear lights is __. The purpose of H+ in the reaction above is to __. 47. A hydrocarbon has an empirical formula CH and a vapour density of 39. Determine its molecular formula. 48. Polystyrene is widely used as packaging materials for fragile objects during transportation because of its __. 49. The process of converting linear alkanes to branched chain and cyclic hydrocarbons by heating in the presence of a catalyst to improve the quality of petrol is referred to as __. 50. The petroleum fraction that is used in heating furnaces in industries is __.